As a college student, I spend a lot of time listening to music and studying, usually at the same time. One thing I’ve always noticed is how easy it is for me to memorize song lyrics. Even songs I haven’t listened to in years, I remember all the lyrics when I listen to it present day. This makes me frustrated and confused- why can’t I memorize my notes as easily as song lyrics? Professor Ian Cross, Director of the center for science and music believes this is due to the structure of poetry and music. Since in music the words match with the temporal structure it leaves our brains with less stress of sorting out what fits where, since things flow easier (The Naked Scientists 2013). When we learn something neurons in our brains make strong connections to create a memory. It can be difficult to get rid of old memories, leaving less space available for new ones.This doesn’t mean though that since your brain is filled with old pop song lyrics, there’s no room left for important information. According to Northwestern University professor Paul Reber, there’s plenty of space available for memories, but information that seems irrelevant when first informed about it, along with its lack of rhythm to follow for structure, tends to be forgotten (Figure One 2013). In an experiment, researchers at Western Washington University found that college students who were given a difficult puzzle had songs stuck in their heads (Figure One 2013). These are otherwise known as “ear worms.” Ira Hyman stated that Similarly to how a memory reminds us of a song, our brains look for patterns to solve problems (Business Insider 2013). This makes it easier for something with a rhythm such as a song, to be memorized. 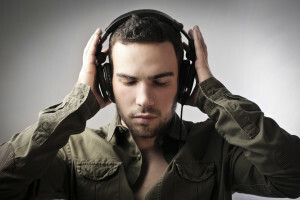 Scientists think of these sound segments that a person gets stuck inside of their head as an “ear worm.” Unfortunately not much research has been conducted on ear worms, but Daniel Levitin, a psychologist who studies neuroscience of music at McGill University, believes that the neural circuits get stuck in a repeating loop and it plays the segment of the song over and over again (CNN 2012). Therefore, when you listen to a song the memory of the beginning part of it gets dug out- hence the “worm” and the remainder of the tune is remembered. In certain cases, ear worms can get in the way of people’s everyday functioning, where drugs are needed to relax the neural circuits that end up being stuck in a loop (CNN 2012). This is usually as a result of human anxiety. It is believed that through evolution our bodies can easily memorize music. Levitin stated that “the structures that respond to music in the brain evolved earlier than the structures that respond to language”(CNN 2012). Since our bodies associate music with pleasure, by releasing a chemical called dopamine, naturally it catches our attention and makes it more pleasurable than listening to a lecture. (Figure One 2013). Ultimately, music is entertaining to humans. The dopamine released while listening to music relates to our evolution of enjoying and memorizing music. Music has a certain repetition and rhythm that makes the tune easier to memorize and remember than listening to random words with no background to them. Next time you’re studying- make a song out of it! Ferris, R. (2013, April 23). Why That Song Gets Stuck In Your Head . In Business Insider . This entry was posted in Uncategorized on October 19, 2015 by Kristen. I have had the exact same thoughts while studying! It is very easy to be frustrated when I learn all the lyrics to a new song in half the time I can retain the information I am supposed to be studying for school. Although it makes sense that researchers have found that songs are easier to memorize because they rhyme and follow patterns, I have an alternative hypothesis for why song lyrics are easier to memorize than school work is. My hypothesis would be that song lyrics are easier to memorize because as humans, we retain information we are interested in more efficiently than we retain information we are not interested in. I think we are probably more interested in listening to new songs than we are interested in the dreadful calc we are working on. The following link explains some of the science behind such a hypothesis. This idea made me think of another interesting part of music and memory. There is this theory that listening to background music enhances verbal learning performance but there has been no real perfect scientific proof. Source here: http://behavioralandbrainfunctions.biomedcentral.com/articles/10.1186/1744-9081-6-3 . There most defiantly a number of scientific studies and analysis but all in all there is no honest and true testing. However, the theory is based on the idea that we can more easily remember music as compared to anything else. So, if we have music in the background when studying does that improve learning. We have no idea yet but more testing may prove this theory.